All of us are witnesses to history in the making. Yet our current events are inextricably intertwined with the past. This is one of the points that was so eloquently made atop Omaha Beach today. I attended that ceremony in Normandy. Here WWII’s Western Allies marked the 65th Anniversary of D-Day. 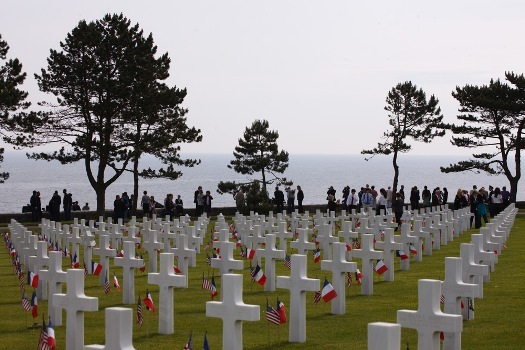 The program, held at the American Cemetery at Colleville-sur-Mer, was attended by an estimated 8,000 people. Among them were more than 150 veterans. President Barack Obama gave prepared remarks, as well as President Nicholas Sarkozy (France) and Prime Ministers Gordon Brown (Great Britain and Northern Ireland) and Stephen Harper (Canada). His Royal Highness The Prince of Wales was an honored guest, but did not address the gathering. President Barack Obama speaks during the ceremony marking the 65th anniversary of the Allied D-Day landings at the Normandy American Cemetery and Memorial in Colleville sur Mer in Western France, Saturday, June 6, 2009. Official White House Photo by Chuck Kennedy courtesy of the White House. Each leader spoke of the critical importance of D-Day to the outcome of World War II, and the impact these bloody beaches and battlefields had on cementing an alliance that would forever change the world that emerged after the carnage. We are the direct legatees, they said, of that pivotal point in time. It was a solemn occasion, made all the more sober by the acres of graves that lined the ceremonial space. This American cemetery, the largest in Europe, is the final resting place for more than 9,000 fighting men who died during the battle for Normandy, which lasted until August of 1944. The probability of rain today was 60%, but the Normandy weather showed how changeable it can be. The sun shone brightly for the nearly two hour commemoration and the sea was calm, as glints of sunlight flecked its peaceful, lapping waters. But almost as soon as the ceremony was concluded with a 21 gun salute and a fly over by American, French, and British fighter jets, the rain and wind — which proved to be formidable problems during the invasion itself — began in earnest. This change came with virtually no warning at all, reminding us of how mercurial the atmospheric conditions of this place can be. The weather was a fateful part of Ike’s decision to launch the invasion on June 6th, rather than the day before or sometime later in the month. I arrived in France on June 5, as part of a small group invited by the White House. 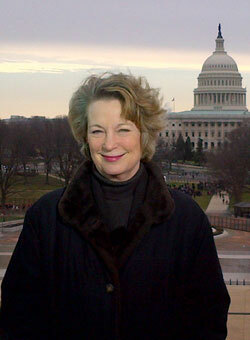 Our delegation was headed by the Secretary of the Veterans Administration, General Eric Shinseki. Other guests included the President’s great uncle, Charles Payne, a World War II veteran who was among those who liberated Ohrdruf– a concentration camp connected to Buchenwald– and his wife Melanie; and Senators Bob and Elizabeth Dole. Film maker and actor Tom Hanks, known for “Saving Private Ryan” and “Band of Brothers,” also joined us for parts of these days. Both Senator Bob Dole and Tom Hanks have devoted countless hours to WWII veterans and associated causes. Not long after our arrival in France on June 5, we attended a ceremony at Invalides, a Paris military landmark. At that time, forty American, British and Canadian veterans were awarded the Legion of Honor, a decoration established originally by Napoleon. President Sarkozy gave four additional veterans this medal at the Normandy ceremony the next day. It is the highest award conveyed by the French government. Many veterans told me that for them this French decoration was the pinnacle of recognition. 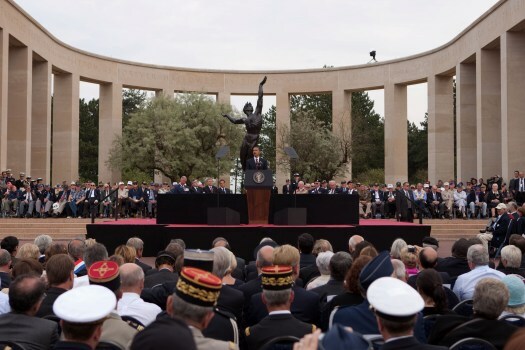 The French acknowledgment and gratitude for their service and for the sacrifices of their fallen comrades deeply moved many recipients, bringing some to tears. At the conclusion of the ceremony, our official party had the opportunity to speak with each of the recipients. Such occasions prompt us to pause and reflect on the past, as well as on our contemporary times. In this difficult time we are now living through, we have much to learn from the legendary courage and bravery exemplified by these men. Click here for photojournalist David Burnett’s images of Normandy and the veterans of D-Day. The American Cemetery in Colleville-sur-Mer, a symbol of America’s sacrifice for Europe’s freedom. Official White House Photo by Chuck Kennedy courtesy of the White House.